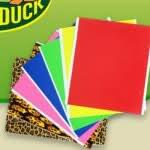 At 6pm EST Duck Tape will be giving away free Duck Tape Sheets on Facebook to the first 10,000 people to enter. If you miss it today, they will be giving them away next Monday at 6pm EST too. Good luck!